Home > Orders > How do I cancel an order? Q.How do I cancel an order? 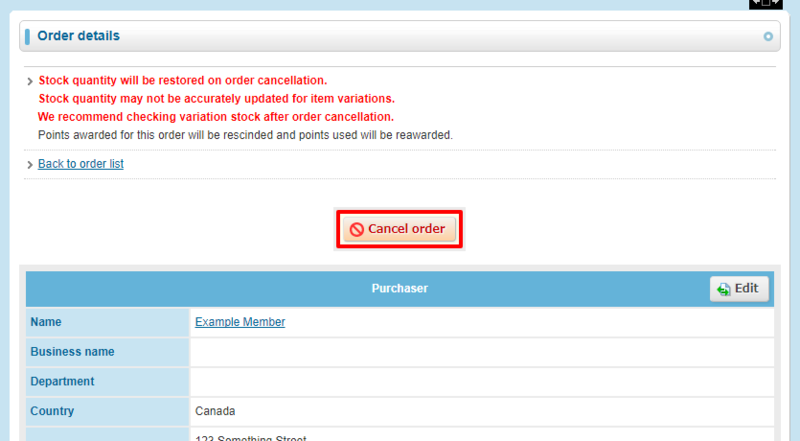 On the page that comes up, there will be an orange button that says Cancel order. Click this button and click OK in the confirmation popup. Cancelled orders cannot be restored. Please take care to only cancel orders you are absolutely sure you want to cancel. Please be aware that no automatic emails are sent in case of order cancellation. Item stock will be restored automatically on order cancellation. Please be aware that item variations may not be restored automatically. Points awarded for a cancelled order will be rescinded, and points spent on a cancelled order will be reimbursed. If payment has been completed, cancelling the order via Shop Manager will not reimburse the customer. Please reimburse the customer through the payment method used, such as canceling a PayPal charge via PayPal.